It’s now March and we’re rolling along on the plans for the 2019 awards. The website was down for a short period of time (unbeknownst to me), but things are back up and running again. Yay! The winners will be announced in late summer/early fall. Time, date and location are TBA. TCAF – MAY 11-12 (tell me which table you are located at and I’ll come to you). December 20 —- It seems that this will be the last holiday season for two prominent Canadian comic book retailers: Vancouver’s Comicshop and Edmonton’s Happy Harbor Comics.. The COMICSHOP, in it’s 44th year, winner of the 2014 Harry Kremer Outstanding Canadian Comic Book Retailer Award has had papers served and is in receivership, and may close at any time according to an article published on the CBC on December 16th. Well, the news we hoped we’d never have to report is now upon us. The Comicshop’s days are now officially numbered, though we’ve yet to learn what that exact number is. This probably won’t come as a HUGE surprise to those of you who have been waiting – patiently for the most part – for any new product to arrive in recent weeks, yet we were STILL hoping for that “11th hour reprieve” that has kept the ball rolling here in the past. Needless to say, the time for picking up any items you may still have on hold here is quickly running out, and we’d also suggest that those with consignment items here pick those up at their earliest convenience. The reasons for this unfortunate turn of events are both numerous and not entirely pleasant to talk about, but this is neither the time nor place for pointing fingers (okay, maybe just ONE finger, but we digress!). Instead, we’d simply like to take this opportunity to thank all of you loyal Comicshoppers out there who have stuck with us through thick and thin these last 44 (and a HALF!) years! We’re eternally grateful for your support and the chance to share the love of this medium we care so much about with you. We’d also be remiss if we didn’t take the time to recognize the numerous Comicshop staffers who have graced these hallowed halls since 1974. It’s an overused cliche perhaps to describe co-workers as “family”, but we still think it’s a pretty accurate description when it comes to our Comicshop family here – a bit quirky, a bit dysfunctional at times, but at the end of the day I think it’s safe to say that we ALL share a certain amount of pride that we’ve been able to be a part of such a fun and unique work environment. The fact that so many past employees still frequent the ‘Shop (however infrequently!) is a testament to the love we still hold for these old yellow & red walls. Of course, none of this would have been possible without those who started it all in the first place – Ken Witcher and the late Ron Norton. Prior to their fortuitous “team-up” in the summer of ’74, the landscape for local aficionados of all things comics and sci-fi/fantasy could be described as “haphazard” at best – essentially used book stores and corner grocers. Their idea to gather ALL of their favourite hobbies under one roof (originally at 3638 West 4th Avenue) can be seen as truly visionary today, paving the way for future “brick & mortar” establishments, all sharing the same desire to impart their love of this special medium with others. We don’t consider it an offhand exaggeration to say that Ron and Ken were true pioneers of the comic book business, not just locally but across North America as well. With this in mind, I think I can safely speak for both Keith and myself when I say how honoured we both are to have been a part of The Comicshop for well over three decades each. When Ron essentially “passed the torch” to us back in 1999, we continued to strive to do everything in our power to keep his legacy alive, regardless of personal reward or recognition. We simply did it for the benefit of our loyal customers and the love of The Comicshop itself and the ideals it stood for. We can’t possibly express to you just how sorry we are that it’s come to this. But again, we STILL ain’t dead YET, so we hope to see you all at LEAST one more time before it’s too late. Later this week we were saddened to learn that 2007 Harry Kremer Award Winning Edmonton shop HAPPY HARBOR COMICS and a primary sponsor and booster for these awards, will be shuttering and moving on by the end of January 2019 after almost 20 years in business. 19 1/2 years ago it began but sadly, all things must come to an end. 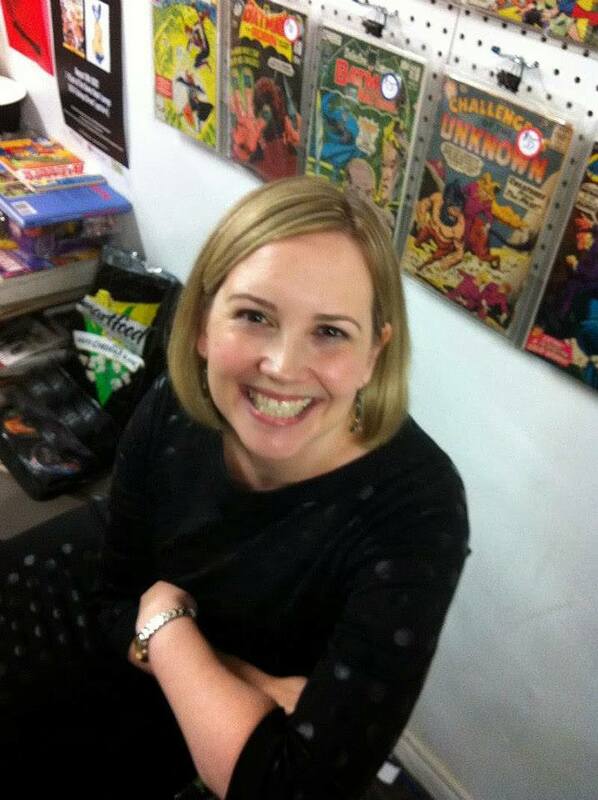 For nearly 2 decades Shawna and I worked to try and provide the best in comics to the Edmonton fan community. Over time, and with the help of many talented and dedicated staff and volunteers, the mission successfully grew to reach out to new and lapsed readers in communities all across Alberta (and further!). We made sure to cover all the bases with mainstream (even that menace Spider-Man), indie, and super-importantly, locally made comics! In the past several years we expanded our All-Ages section to an award-winning level (thanks to Archie getting married), nurtured a much needed PRIDE section, and built a library/school program to ensure the best materials (and Spider-Man) are on the shelves in hundreds of libraries all around the province. We developed programs to support the creative community as well, from our Artist-in-Residence program to the Kid’s Camps to the Open Door collective and more. To us at The Harbor, the creation of comics was as important as the enjoyment derived from reading and collecting them. HH also played a part in developing comics fandom by purchasing tables at the long-running Pop Culture Fair and giving those tables for free to local creators, starting in 2006. As well, both Shawna and I served on the Board of Directors for the Calgary Comic & Entertainment Expo during years 2 through 4, an amazing experience even with all the Spider-Man cosplayers. Advocating for comics literacy was key as well. Beginning in late 2007, HH and local artist volunteers would visit schools and talk to students about how comics are made. This morphed in our Comic Book Fair program which visited 77 different schools and donated more than $10,000 worth of comics back to those libraries. But all of this you know already. So what does HH closing mean to you and your hobby? There will be 2 more weeks of comics for file customers, tomorrow (including Amazing Spider-Man) and Wed, Dec 26. This should everyone a fair amount of time to find a new provider for their hobby. While we know it won’t be the same, we ask that you don’t give up on your love for comics. Our current team of Corinne (Been), Tania, Rudi, Kyle, Britt, Andrew, and Sylvia will all be wrapping up their duties and shifts as of Dec 31. Then HH will be around until Jan 31 with some revised hours as we clean stuff out. We are planning a massive THANK YOU party on Saturday, Jan 26 so keep that date open on your calendar! There will be more details to come. This news will shock most of you and for the suddenness of it all, we do apologize. Shawna and I have been discussing this for some time and we’ve both felt it was time for us to do something different. We have been spoiled and are extremely grateful to have met hundreds of amazing people over the years who share our passion for this wonderful medium. We couldn’t have asked for a better time of our lives. September 5, 2018 — The JOE SHUSTER AWARD is Canada’s national award that honours and raises the awareness of Canadians that create, self-publish and sell comic books, digital comics and graphic novels. The nominated works were published between January 1 and December 31, 2017. The award winners were chosen by a jury vote. I regret to inform all that we are unable to finalize the 2018 winners and make the awards in time for the ceremony on July 7th in Montreal at the Montreal Comic Con. Unfortunately our juries need more time to deliberate and gather information/review materials, and the Dragon Award nominees have yet to be announced. Based on this, after consulting with other members of the committee, we have decided to postpone the ceremony and reassess the timeline. We will still proceed with a panel on July 7 at 5:30 where we will discuss Canadian comics and have some special presentations to the 2017 winners who are present at Montreal Comic Con 2018. More information to come on when the ceremony will take place. Here’s a list of what we have received to date. All were self-published in 2017. The list is still being updated. If you still want to submit your comic for consideration please visit here. Submissions are now closed as of today (5/13) – aside from one package at the post office which will be picked up 5/14. This year we will be diving the Gene Day Award into two categories, the names are still being worked out, but essentially we will be moving Anthology Collections featuring the work of 3 or more separate stories with different creators/creative teams into a separate category. Today, the people behind the Calgary and Edmonton Comic and Entertainment Expos announced that the shows are joining the Fan Expo HQ family of shows that includes shows in Toronto, Regina, Vancouver, Dallas, Boston as well as the MegaCon brand shows in Orlando and Tampa Florida. The Calgary Expo has grown steadily since the mid-2000’s and is now a massive entertainment event that is one of the biggest events of it’s kind in Canada, and North America in general. Please note: The Saskatoon Comic & Entertainment Expo is not part of the arrangement and the organizers behind the Saskatoon event have announced they plan to continue the show as an independent entity again. To be up front about this, I am the Comic Relations Coordinator for Fan Expo HQ as well as the director of these awards, and I am now booking for the Calgary and Edmonton events. I’ll be working to ensure that those events have well managed comics sections with a great selection of comics talent as guests. The comics team at Fan Expo HQ is very excited about the possibilities and personally, I am excited to be returning to the Calgary Expo again after many years absence. Last night in San Diego, the annual Will Eisner Awards were presented and a number of Canadians took home or shared many of the top prizes. Big winner of the night was Fiona Staples, who continues to win accolades for the ongoing image Comics series Saga (artist, cover artist, best continuing series). A popular page on this site, which receives a minimum of 100 hits on even the quietest of days has had the links removed for the time being: CONVENTIONS ACROSS CANADA. The page had not been updated since summer 2016 and the CCBCAA is taking a step back because we aren’t regularly updating the page, although conventions are taking place all of the time across the country and new ones are popping up seemingly daily. Nearly every weekend there are multiple happenings that would qualify for our list (having comics content – creators and/or sales of comics and graphic novels). Another issue with the explosion of new comic conventions is cancellations. For various reasons conventions do get cancelled – vendor tables sales are weak, funding falls through, show is unable to book guests, etc. – and we would prefer to have accurate listings which means checking to see if events actually happen. While we are certain that the page will be back to listings of some kind, we are currently discussing the best way to focus on accuracy and quality.